Although “The Cutting Edge” is very much of its time – that is, the early 90s – in terms of its clothing, strict devotion to grimy lighting and anomalous slow motion to make the whole thing come across like a feature length music video, it is also narratively timeless. Its screenwriter was Tony Gilroy, who has gone on to bigger and better things, and for “The Cutting Edge” he culls from two dependable genres, the underdog sports story and the rom com, and melds them, like if William Powell and Carole Lombard had made a movie about bickering figure skaters trying to qualify for Garmisch-Partenkirchen which, oh my God, would that have been something. 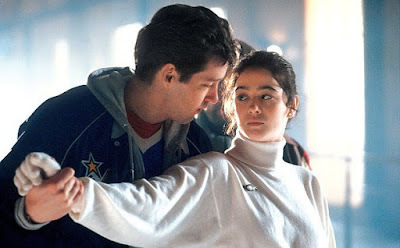 Instead we get Moira Kelly as Kate Moseley, so off-puttingly uppity that she can’t keep a figure skating pairs partner, forcing her semi-domineering father (Terry O’Quinn, finding more layers than I remembered) to pair her with a down on his luck ex-hockey player, Doug Dorsey (D.B. Sweeney). They bicker and cajole their way to the Olympics in Albertville, with director Paul M. Glaser rarely easing off the gas and Gilroy wielding his beloved story reversal to the hilt. Gilroy is so dedicated to the reversal, in fact, that the movie opens in the midst of one, with American Olympic hockey player Doug Dorsey waking up late in the bed of some foreign competitor, late for his hockey game. It is suggestive of the Olympic Village we always hear about, but no doubt actually showing the Village wasn’t in the budget so we don’t see it, and anyway, we don’t have time to breathe anything in because “The Cutting Edge” barely lets us breathe at all. This Action Already In Progress beginning is emblematic of the movie’s overriding mania, narratively and aesthetically, with close-ups the favored camera angle, for conversations and ice skating, and pop music all over the soundtrack, reaching back to the 80s but also moving forward to the 90s. Watching this movie, frankly, made me feel like the guy in “Back to the Future” listening to Marty McFly’s band audition. “You’re just too darn loud.” This movie is so loud. I can’t help but think this was part of the plan, amplfication as a means to spruce up figure skating. Long before Margot Robbie’s Tonya Harding was hollering at judges in “I, Tonya”, Doug Dorsey was convincing Kate Moseley (Moira Kelly) to ditch the woodwinds and get funky. Of course, Doug will have to meet Kate in the middle, or close to it, and Kate will have to meet Doug in the middle, or close to it, which becomes caught up in her impending marriage to some paint by numbers dolt that crumbles when she and Doug fall in love. Sweeney, however, works better when they are at odds then he does feeling lovelorn, and he never quite makes his turn toward wanting to figure skate feel more than compulsory. Kelly, on the other hand, who gives as good as she gets too in their quarrelsome scenes, actually gives her Falling In Love bits a more truthful ring by not playing them lovelorn at all and going instead for something closer to shock, with wide eyes and curt replies, like she cannot quite believe she has Fallen In Love. That wide-eyed air also aids Kelly as her character is made to realize she has been entirely molded by her father in the name of this Olympics quest. In that air you can sort of see her snapping back into reality, and suddenly coming to terms with a life that is not her own. This figure skating movie’s great failing in the end, however, is, uh, its figure skating. It perhaps goes without saying that neither Kelly nor Sweeney were figure skaters of any repute, learning how to do it just for the movie, and it shows. The skating scenes, of which there are necessarily many, alternate between quick cut close-ups of skates slashing across ice and the determined faces of its characters before then cutting to wide shots of the two doused in shadows to obscure the skating doubles. There was no real way around this, of course, and in her re-assessment of the movie for Vulture in 2012, Amanda Dobbins offers the standard rebuttal of just going and watching the effulgent, immortal Gordeeva & Grinkov on Youtube if you want real figure skating. But that is a critical cop out. If you want to make a movie about figure skating, sorry, but find a way to better blend the actual skating with the illusory or you’re going to get dinged. That’s the contract you enter into as a moviemaker. And a scene at the Olympics gives away “The Cutting Edge’s” game when we see a nameless pairs skating couple in long shot and you remember the sport is best seen like this, in wide frames and continuous takes, like Rogers and Astaire when they danced, and it was Astaire that the great Norwegian figure skater Sonja Henie referenced when she came to Hollywood. Off the ice, “The Cutting Edge” sort of gets by, but on the ice, nothing can compare to Henie’s concluding ice capades in “Sun Valley Serenade” (1941). There are some things even the movies can’t fake. This is one of the few "wholesome" movies we were allowed to watch on weekends at my Lutheran boarding high school. I have a deep allergic reaction to it to this day; I must've sat through it from sheer boredom or seen it in the background while playing cards in the cafeteria 20-25 times. For years just the sight of D. B. Sweeney in anything would send me running for the hills. I find this incredible because I remember watching this at a Lutheran church lock-in. What is about Lutherans that find this movie so wholesome?